Back in 2004, when I was in my twenties and the future still opened before me like an endless golden avenue (one on which that vague, distant shadow was surely a trick of the light), I spent a lot of time playing Star Wars Galaxies. This was, self-consciously, an act of escape. The future might have seemed infinite, but the truth was that in 2004 I was having a little trouble with the present. Writing didn’t seem to have made me a writer, and I couldn’t quite understand why. I think I made $4,000 that year, writing unread book reviews for barely read literary magazines. My wife and I survived on her tiny humanities grad-school stipend in New Haven, where we ate out twice a month (pizza at Bar, or, if I had been paid for a piece, Ethiopian at Lalibela), bought used books, and wore sweaters from college till they had holes in the elbows. Which wasn’t suffering — not even close. But the immediate possibilities of reality still left something to be desired. Ducking out of my everyday world to play a dashing Star Wars hero in a massively multiplayer online game felt like a gleeful riposte to my unfinished, unfinishable novel and to my piles of student-loan-deferral paperwork. We found room somewhere in the budget for the $10 (was it $9?) monthly subscription fee, and I installed the game and started playing. But maybe “playing” is the wrong word here. Maybe I mean “trying to play” or “trying to convince myself I was playing,” because the truth is that I was never entirely sure I was doing it right. I was never sure what it was we were supposed to be doing, those thousands of us who had created avatar-characters and set them loose in this online theme park based on the Star Wars intellectual-property universe. It seemed to involve a lot of guiding our avatar-characters out into the desert to use martial arts on small families of sedentary reptilian antelope, but as I said, it’s possible I was missing the point. Your eye may have glided over the “a lot” in that last sentence, so let me circle back. If you were not a participant in the early wave of MMOs that launched near the beginning of the millennium, you cannot possibly imagine how much running into the desert to visit karate kicks upon faintly bovine herd reptiles these games entailed. From the moment you spawned in your first n00b settlement (Mos Eisley for me, never a more wretched hive of scum and third-level players standing around by the entrance trying to scam brand-new ones), life became a merciless and unvarying routine. Its steps were: Receive Mission (“run out into the desert and kill five Jambo Toads” or whatever), Perform Mission (run for 10 minutes, mash buttons for 45 seconds), Report Mission Success (run for 10 minutes, push a button, receive a token reward), Repeat (only 658 more missions till you unlock the prologue to the next sub-level!). Modern mobile games retain some of this architecture, requiring geometric increases in effort to obtain arithmetically increasing rewards. But life is faster now, and the app-store jungle isn’t kind to entertainments that leave dead air between amphetamine hits. A game as meditatively hostile to fun as Star Wars Galaxies is hard to imagine these days. I mean, running. So much running. Running is most of what I remember about the months I spent in that game. Running over lovingly rendered sandscapes toward Armageddon sunsets. Running through vine-draped tropics full of crumbling stone ruins. The little plat-plat-plat of my character’s feet as he ran. (My character was a Twi’lek martial-arts master with many apostrophes in his name, and I felt sure he would run with more stealth and fewer plats than this, but I also understand how he might choose not to bother after a while.) Literally just holding down the W key for minutes at a stretch while making for some flashing pixel on the outer fringe of my minimap. The mind-set this life of permanent sprinting encouraged was a kind of determined emptiness. Three more hours, and I’ll be able to kick a slightly larger monster, this time while spinning. Two more days, and I’ll be able to buy a piece of upgraded armor for the bottom half of my left forearm. Occasionally, the proto-hallucinogenic state of impulse-denial in which you now spent your conscious life would produce a moment of real beauty — you’d turn to see the Tatooine sun spreading fire through the clouds, just as some indelible John Williams melody went keening through the French horns. But most of the time? You were just running. Or I was, anyway. One of the reasons I thought I might not be playing the game right was that I did not really go in for spending time in towns, where I could have congregated with my fellow players. My fellow players, in general, were as mysterious to me as the point of the game itself. You could say, of course, that your fellow players are the point of a massively multiplayer game, and that in missing out on one I was missing out on the other, and that in doing so I was porting one of my major failings as a regular offline human into gamespace in a way that was both predictable and an ironic commentary on the doomed nature of escapism itself. You could say that. But I’m telling you, these guys were strange. What was strange about them was that they were so entirely normal. Here we were, dressed in second skins, shiny anonymous aliens to one another. Yet everyone talked like they were back home in Sacramento. People said “dude.” People said “lol.” People talked about the game as a game, as in “Fireblake and me were gonna go pvp my cousin’s guild but I wanna find Shrikelord to buff us.” This was what we’d escaped into? Wasn’t this just the same dumb world we’d left? Every now and again you’d run across someone role-playing flamboyantly, which of course was even worse. There was this one guy, Moonie. Oh god, that guy. I had joined a guild1 by the time I met him, tried to make some friends, since it was clear I was missing something. Moonie had tremendous clout within our guild, mostly, I think, because he was always, always online. He was always online because he was determined to become a Jedi, the roughest grind in the game. “I will be a Jedi,” he told the group chat every few minutes. Moonie was unhappy in life because his wife and stepson gave him problems, problems he shared often in chat, from his gaming space in the garage of his house where his wife was less likely to bother him. The kid wasn’t a bad kid but couldn’t get himself together. The wife resented the hours she spent working the hospital desk while Moonie stayed in the garage, becoming a Jedi. He had a heart problem, I think? But he could sneak cigarettes in the garage, while growing in the Force. I will be a Jedi. I will. And maybe this was useful for Moonie. Maybe it was therapeutic for all of us, to sit with our problems in a tauntaun-adjacent space. It was hard, though, not to feel that something had gone awry with the basic promise of imaginative escapism. No one’s fantasy of Star Wars ever involved hearing a depressed fiftysomething complain about his stepson,2 or eavesdropping on herds of leetspeak-bros debating the pluses of different skill trees. But that was the world Star Wars Galaxies gave you. It implied two lessons, neither unique to fantasy fandom but both still useful when thinking about it in 2015. Nothing ruins tourist destinations like tourists. And you can run to Dantooine, but your wife is still going to smell the cigarette smoke. 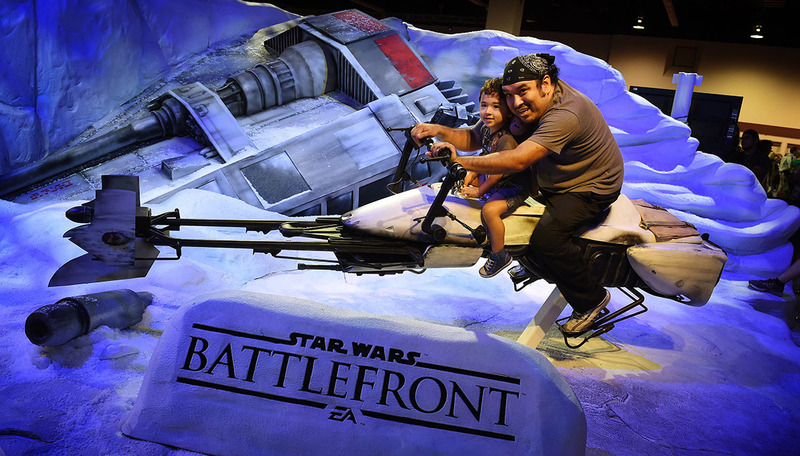 MARK RALSTON/AFP/Getty Images A ‘Star Wars’ fan and his son during the Disney D23 Expo. I’ve been remembering Star Wars Galaxies ever since the news broke last week that Disney is planning to add a Star Wars land to all of its major theme parks.3 People seem excited by this, I guess? It’s tough to say. We’re a long way past the prequels, and we’re a long way into the hype cycle for Force Awakens, and we’re at a place where any independent thought you can have about Star Wars seems kind of wearying and pointless. For a series in which the ultimate act of heroism involves not surrendering to the will of an authoritarian central planner, Star Wars certainly encourages surrender now, or at least patient acquiescence to the corporate expansion-timeline being drawn up in Burbank. You’re going to get what you get. It will probably involve R2-D2. Might as well try to enjoy it. Still: Star Wars Land. Hey, maybe it will be cool. I remember the way those movies made me feel when I was a kid, though. That’s another thing that feels wearying and pointless, now, insisting on the special authenticity of the original trilogy. There are adults, people the same age I was in 2004, who saw Phantom Menace first and think of it as the start of the series. But maybe even they would agree with this: What made me fantasize about living inside Star Wars was not just the chance to meet a Wookiee or fly a starship. It was the excitement and clarity of purpose that seemed to be possible there. Star Wars was full of cool stuff, but it also represented a way of feeling that I liked. It was a way of feeling that seemed particularly resonant given the perceived size and sketchbook quality of the setting. You didn’t need Boba Fett’s backstory, didn’t even care about it, because the whole point of the Star Wars galaxy was its vastness. You knew it contained infinite other creatures as weird and great as Boba Fett. You could imagine crossing into it and encountering some of them. This may be a common complaint. But excitement, clarity of purpose, perceived size, and novelty weren’t the priorities for the franchise once it started up again in 1999. They just weren’t. At some corporate level it was decided that Star Wars should expand vertically rather than horizontally, that what we really wanted was more and deeper Boba Fett backstory, more and deeper insistence on the mythic centrality of the characters and settings we knew and loved, rather than new characters and settings that might be just as inviting. Naboo? Come on. Mace Windu? Perfunctory. Does even the most die-hard Clone Wars fan actually care about General Grievous? The new trilogy — that’ll add new characters. Maybe this will solve the problem? On the other hand, there’s a lot of wide-angle sand in the trailer, and a familiar little droid, and that big “we’re home,” and also the presence of reboot-overlord J.J. Abrams, whose signature quality as a filmmaker you could define as “frenetically cautious retrenchment.”4 Disney will be smarter than Lucasfilm, more ruthless than Lucasfilm. But these very qualities probably dictate that Disney will keep marketing and fan-servicing backward, even as the franchise pushes carefully ahead. I’ve never been able to square my mind with the idea that it’s immature to mind this. We have to live in reality. But part of living in reality is having an imagination, and the imagination is not so easily reconciled to its surroundings for us to scorn any source of relief. This is the great, humble service that pop genre fiction like Star Wars renders, to give us a vision of the kind of world that might accommodate imagination rather than work against it. (Even if that world is instantly commoditized, even if every part of it collapses into propaganda the moment you put pressure on it; you think realism is never commoditized, never collapses into propaganda?) By the late ’90s, when it became preoccupied with visiting and revisiting the same few marketable characters and worlds, Star Wars had stopped representing that vision. It started representing something else, something stranger, something like the commemorative marker where a vision used to exist. It became a tourist attraction rather than a place. And again, I might be playing the game wrong, might be too keen to run out into the desert on my own instead of hanging out in the cantina with my fellow human fans. But it seems to me that there’s a tension here between two styles and two eras of creation. In one, the older, the product of an individual imagination is shared with others. In the other, the newer, the creative process is conceived of as a kind of ongoing commercial collaboration between the craftspeople who oversee franchises and the fans who care about them. This isn’t a new idea, certainly, but it does explain a lot about the direction of Star Wars. It explains a lot because the individual-artist model, as hokey and old-fashioned and prone to flameouts as it is,5 can veer anywhere, try anything. The collaborative-stewardship model is centripetally conservative, tuned to give you what you already know you like instead of asking you to like something different. And so in place of wonder, you get these grooves of meaning. You visit Tatooine so many times that Tatooine ceases to be a planet. It’s a signifier, a brand name, a marker that means you’re in the Star Wars IP network and should look for the familiar signposts thereof (droids, jawas, speeders, sand people, all of which will be required to make an appearance). Maybe Star Wars Land will be great. But it’s hard not to see it as a further imaginative contraction, the literalization of my Galaxies experience. Visit the same five planets, take your picture with the same 12 characters. Keep talking the way you always talk. Only now you get to sit on the flume log next to the mildly depressed twentysomething writer and guy with the heart condition and secret cigarettes — which is fascinating in its own way, more fascinating than Star Wars, even, but again, presumably not what brought you to Hoth in the first place. Who knows where this franchise is heading, except into galactic omnipresence. I’d like to be optimistic about what the Disney phase will mean. But we live in a moment when escapism is not about a different kind of life but the same life in a different setting, not about the place we’re escaping to but the people we’re escaping with. And I’m sorry, but I have a bad feeling about this. It’s one thing to escape from a Sith Lord. There is no escape from us. Little in-game clubs whose purpose was to help each other kill ever-increasing numbers of totally peaceful large grazing animals, and also other guilds. Although tell that to my Uncle Owen fanfic. Full disclosure: The Walt Disney Company owns this website and has thus far bafflingly declined to put me in charge of the franchise. OK: frenetically cautious retrenchment plus lens flare. Not that I’m not very excited to read George R.R. Martin’s blog posts on the Geno Smith incident.